Project Completion Date / Date Building Occupied: Building remained occupied during renovation. Originally built in 1950, the UN had aged and had inefficient infrastructure, code compliance issues, and asbestos containing materials. The renovation construction began in 2008 and was completed in June 2015. At its height, this $2B renovation employed over 650 contractors and design/construction professionals. The project has achieved an overall LEED Gold for the campus and LEED Platinum for the Secretariat. The campus is targeted to achieve 50% energy savings over the existing. Throughout the renovation 50% of the campus remained occupied, requiring careful phasing of the new infrastructure. The United Nations is perhaps the only place in the world where all the world leaders gather for one week. The safety and security of the site was a major concern during the design process. The security design incorporated many levels of perimeter and standoff security measures. The architectural and infrastructure components incorporate measures to help withstand blast and other attacks. The original target of the project was 30% savings over existing. But through careful decisions, balancing budget concerns, and impacts on energy, the final targeted saving is just over 50%. Some of the sustainable techniques applied include; LED lighting, demand ventilation, daylighting controls, active blinds, displacement ventilation, occupancy based mechanical and lighting controls. The major meeting spaces and large conference rooms had held up well; so well that the look and feel of these rooms were deemed to be preserved through the renovation. The technology for simultaneous translation, broadcasting, and telecommunication within these halls was to be brought to state of the art. The original office environment reflected office spaces of 1950, many private offices at perimeter windows with interior workspaces for administrative help. The workplace renovated design incorporated into the Secretariat Office Tower reflects the trends of today; mobile workforce, hoteling, and limited private offices and maximization of daylight for all spaces. The redesign of the United Nations included a new Building Management System (BMS) system and new lighting controls to automate and optimize the efficiency of newly installed mechanical and electrical equipment. Transparency is one of the goals of the United Nations and reflecting this in the architectural elements is important to the UN. Incorporating security, blast, and access control while still inviting visitors, and being able to look into the site and building from street level were important considerations to the screening and security elements. The United Nations works closely with war victims and post-war impacts to civilians. Incorporating accessibility for every building and space was not an option, it was a project requirement. The project lasted seven years and come within 10% of the original budget, which for a project of this magnitude and complication is remarkable. Detailed pre-construction evaluation and investigation limited the unknowns encountered. The Construction manager was on-board during design development to identify constructability issues. This was one of the largest Historic Preservation projects ever completed. Many of the rooms incorporate finishes which were gifted from host countries (chairs, wood paneling, etc.). These items were carefully removed, catalogued, sent offsite for refurbishment and then reinstalled. Historic Preservation Guidelines were developed at the beginning of the project to help guide the design as to what could be altered and how. Behind the walls and ceilings, every duct, conduit, wire, and lightbulb was replaced. The General Assembly room at the UN. Changing the workplace culture from private to open offices to increase communication and collaboration between UN departments, as well as provide more flexibility for how spaces might be used and where departments might be located, were project goals. The feedback from the UN staff has been overwhelmingly positive. The site was heavily impacted by Super Storm Sandy. The resulting damage and revised flood maps for New York City led to further waterproofing, hardening, or raising of critical infrastructure components. This contractual breakdown of the $2B increased the level of communication required, including requiring weekly meetings. With this many designers involved; finding the right mix of personalities to help leverage the talent available was important. The UN leadership carefully selected the project management teams from each firm to help build the right mix at the table. During the design process—the design team exchanged deliverables for peer review. Common elements of the design were assigned to specific teams members (Historic Guidelines, Sustainability Guidelines, Campus Energy Model, Architectural and Engineering Design Criteria, Architectural and Engineering Design Specifications, etc.). These common elements were issued for review and then used across the buildings/contracts for consistency. Weekly project meetings were held and bi-monthly construction field reports from the design team were provided. This kept the RFI and shop drawing responses on track and helped identify any construction quality issues early before punchlist. During the procurement process, campus-wide elements such as Fire Alarm, BMS, Electrical Panelboards, and AC units required a different buying approach for the entire campus even though the designs for many of the campus elements were not complete. This required early issuances from the design teams for these building elements and then change management post award. Part of the sustainable efforts at the United Nations includes Green Housekeeping activities. Starting these efforts earlier so that they are business as usual before the project is completed is important. The facilities staff has been trained on the new chiller plant machinery and Building Management System. The chiller plant load has been reduced significantly and the staff carefully manages the plant to maximize efficiency and still exercise all of the machines. Following pull the plug testing and making some remedial repairs as they were found, and monitoring the energy usage of the campus carefully. Also some operational set points are modified as seasonal temperatures are seen. The majority of the design was done using AutoCAD. The chiller plant was modeled in 3D using Revit to help prove the complicated piping phasing. Laser measuring of some of the historic halls such as the General Assembly and Security Council was used to help catalog and detail the measurements of existing conditions for replication during construction. The project utilized Equest for energy modeling. Data loggers were used to confirm the existing building operation hours and schedules and the existing building model was further calibrated against the energy bills. An ASHRAE 90.1 building equivalent model was developed and then an as-designed model. Field meters (kw/kwh, btuh, etc.) totalized on a monthly basis are prepared in a monthly M&V Energy Report benchmarked against the campus energy model; by building and overall. The report also reports the number of monthly degree days versus the energy model for calibrating apples to apples. The project teams utilized Newforma to help track RFI, shop drawings, and drawing submissions—the majority of the shop drawings were submitted and reviewed electronically, greatly reducing paper waste. Fiberglass pipes for river water heat rejection to resist corrosion. Mixture of LED, fluorescent, and halogen light source to create highly efficient broadcast quality lighting for major conference rooms. Polymer applied in concrete river water intake—similar to super pool liner. New Secretariat tower curtain wall that replicates the look of the original with a high-performance façade. New concrete pours included recycled materials and new millwork from rapidly renewable woods. Major mechanical equipment decisions were informed by the energy model, cost estimates, impact to ceiling heights, and comfort concerns. Con Edison 480V electrical vault being constructed. New glass façade of the Secretariat office tower being installed. The energy model was used extensively throughout the project as a decision making tool. This included comparing façade options and chiller plant options and the impacts of active blind; and then reviewing the interaction of these systems together on the campus. The energy model became an invaluable decision making tool to provide data on the impact of each of these decisions on the performance of the campus. Community: Options of relocating the United Nations headquarters were discussed; however the impact to the supporting neighborhood elements (country embassies and missions, transportation) and the international land that the UN sits upon cannot be readily replicated. Blast/Threat levels and design criteria increasing in levels due to worldwide events. Flood maps revised due to Super Storm Sandy. Departmental size and need changes. The Project leadership was careful to allow construction to continue to the greatest extent and stopping the construction/design early to avoid cost impacts. This leadership vision and decision making, quite simply saved the project. Goals that were met, especially as they relate to the eight design objectives. Accessible: Early identification of the perimeter security elements that must also address site egress/evacuation and accessibility. These elements and the divergent requirements required careful planning and sometimes custom solutions; adding cost and lead time. Aesthetics: The original UN campus was designed by an international all-star team of architects; and keeping the look of the campus intact throughout the renovation was one of the primary goals. Constant reminders to the team of the historic preservation guidelines and project goals were required so that the team did not simply solve field issues in what appeared to be the most cost-effective and pragmatic decision without awareness of the great project goals. Cost Effective: The leaders of the UN are often asked if another headquarters could have been built for the same money. The answer might be yes, to replicate the functions, but not in replicating the current look and historic value of the campus. Perhaps the most energy savings would be found in not having built a new campus considering that over 90% of the structure and structural elements remained unchanged (thousands of tons of concrete and steel would have been demolished trucked out and then thousands of tons of concrete and steel trucked and poured back in). Functional / Operational: Earlier and more involvement of the facilities and operational staff would have benefited the design and facilities staff. Picking a few champions; experts in their field to have input and then champion the project outside of the project team. Historic Preservation: Step one was creating the Historic Preservation guidelines; two other equally important steps were having a pragmatic application of those guidelines and then keeping them relevant and aware for a multi-year design construction effort; identifying a champion for them who had decision making power and attended the required meetings. Productive: Incorporating flexible infrastructure for the MEP support and IT infrastructure allows for change which will always occur to be incorporated more easily into the design/construction. Early identification of future workplace trends is a worthy exercise before pen to paper on design;- building modularity and flexibility into the design—allows change—which everyone knows will happen. Secure/Safe Goal: The security and blast measure required careful planning to incorporate without being intrusive. Often this presented aesthetic challenges. At one juncture, the occupied spaces of the conference building program had to be rotated 180 degrees to remove them from above the FDR drive which runs below the UN; during that challenging time the engineers found opportunities to take the un-occupied space and create mechanical rooms in the blast buffer zone that also allowed for the design of a high displacement ventilation system in some of the larger conference building spaces. Sustainable: The energy performance of the campus reflected in the design and energy model - is in reality greatly impacted by how the campus is operated. Early involvement of the facility engineering staff during the design process would have been helpful for them to understand the how's and why's of the design; and would have then energized them to make sure they did their best to help it run that way. How the strategies selected were implemented and evaluated in terms of their effectiveness, including both qualitative and quantitative performance information. Chiller Plant Configuration: The chiller plant selection was based upon several factors including energy performance, cost, redundancy in fuel source etc. Air Distribution: The air distribution selection (overhead, hybrid overhead, and perimeter fan coil, chilled beam) was evaluated against several criteria (performance, comfort, first cost, ceiling height achieved, etc.). Critical Equipment Location: The siting and location of the critical equipment required consideration of several factors: flood zone levels, outside threats; distance from loads, and redundancy in location and equipment. The energy model was used to help determine the interaction of various system and building elements. For instance without a fixed budget; the performance of various combinations of façade glazing and chiller plant configurations were evaluated to find the best performance value for the campus. The design was very large and consisted of various architectural and engineering teams; although somewhat cumbersome, the team integrated well and was able to establish early in the design stages on design standards and strategies which were then implemented in the various buildings by the individual team. Each of the design teams products were reviewed by the other teams as part of a qa/qc and standardization practice. How building materials, systems, and product selection addressed the design objectives, goals and strategies. 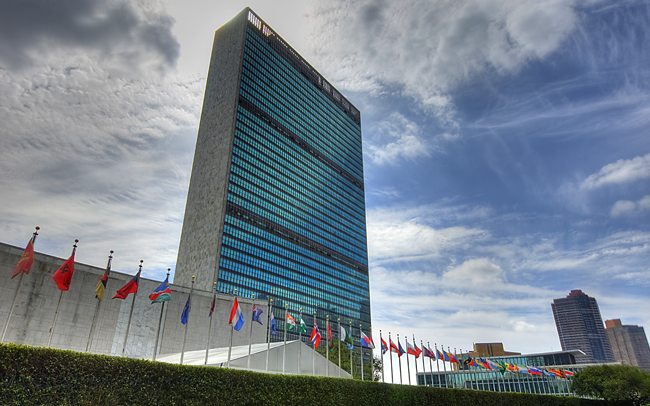 The façade selected for the United Nations had to meet several criteria, including high performance, historic preservation, and blast considerations. Fiberglass piping was used for the river water piping to withstand the corrosive river water. Materials were selected with the LEED Gold goals targeted; renewable, proximity to site, efficiency etc. The United Nations is woven into the neighborhood and the surrounding buildings are embassies and housing for many of the countries and support staff. The design was carefully adjusted to not alter the exterior look of the UN and any new equipment had to meet stringent acoustical requirement so as not to disrupt the neighborhood. The United Nations and its surrounding context. Active Blinds had a twofold affect—reducing glare of the sun rising on the East River for employees while decreasing solar heat loads on the campus mechanical systems. Blast considerations required reprogramming which allowed for underfloor air distribution for some large conference rooms. Offsite swing space became pilot projects for the workplace strategies implemented and those lessons learned were incorporated into the headquarters design. View of the United Nations Headquarters in the background across the East River. The project incorporated a measurement and verification plan; to verify actual performance against the energy model. Electrical, flow, and btuh meters were installed throughout the campus to measure lighting, power, heating and cooling energy by building to help verify performance and help trouble short underperforming areas of the campus. The UN has used the renovation to lead by example, and by renovating in place, has kept a vital part of the New York City landscape intact with all that the United Nations headquarters brings and represents to this city and the world.